With choices in style, upholstery, and even wood informed by or directly imported from France, an admixture of French and colonial-made furniture allowed elites in New France to claim metropolitan trends and arbitrate their diffusion as discerning taste makers and connoisseurs. In addition to French forms, "English" furniture is often found documented in Canadian probate inventories, a fact that attests to the fluid nature of style and design in early America as well as the perennial problem of inter-colonial smuggling. 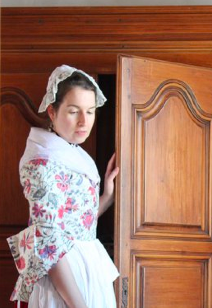 Some of the earliest documented furniture in French Canada can be linked to specific members of the colonial elite. The Louis XIII or Mannerist style table and two chairs seen above were among several pieces owned by Marie-Barbe de Boullogne, the widow of Louis d'Ailleboust de Coulonge. Louis d'Ailleboust was the third governor of New France, and his widow found refuge at the Hôtel-Dieu, the public hospital run by the Augustinian Order, in 1670. Upon her death in 1685, she left her earthly possessions, including this suite of furniture, to the Augustinian nuns of Québec. The Order still preserves these objects.